Yesterday Alamy contacted contributors, many of whom were terminating their contracts, to say they were now trying to "address fears about re-use and licensing images after termination", a major concern raised by EPUK. 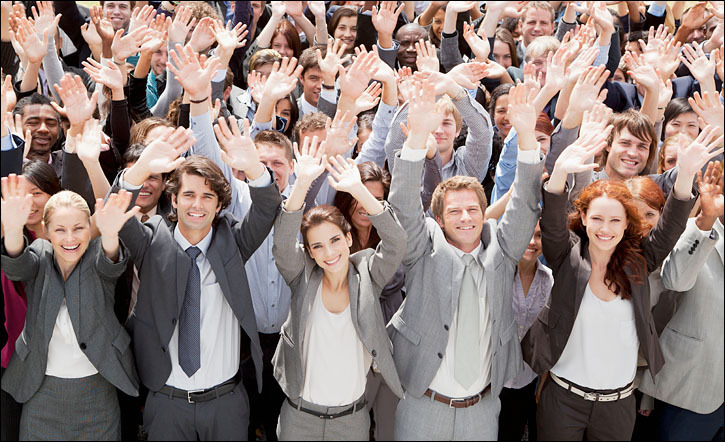 Generic business people celebrate victory outside EPUK Towers yesterday. Photo Gregg Vignal / Alamy. Publication of the article "Why I'm Leaving Alamy" by EPUK moderator David Hoffman was the turning point. An open letter to Alamy published two weeks earlier by EPUK had identified a number of clauses in the proposed contract amendments that it was unhappy about. The most damaging clause, in EPUK's opinion, was clause 6.4.1 which meant that even photographers who left Alamy would never regain full rights over an image that Alamy had ever sold or which a client had downloaded. Five days later EPUK published Alamy's reply fudging that issue and giving reassurances which were not consistent with the contract wording. Hoffman responded with his Opinion piece. It included a list of the now broken promises Alamy had made on its launch in 2000 such as "It's not like you are entering an arrangement that ties your images up for a lengthy amount of time" and "We have no interest in making changes to the contract to the detriment of photographers now or in the future." Alamy also promised photographers, who would have to do all the scanning, captioning and keywording of their own work, that they would receive "Around 87% of the sale!!!! YES! 87% !!!". Photographers now receive 50%. Today Alamy Member Services told one EPUK member that the contract changes that would have come into effect on April 1st have been annulled. New changes will take effect after May 14th 2015. Thanks to David Hoffman et al at EPUK for taking a stand against this proposed contract shift. Outstanding news for all photographers, not just those in the UK. Kudos to all involved on both sides. However, Alamy contacted me as asked me if I would now like to reconsider my resignation. I said I appreciated that they had responded relatively positive and I would stay if they paid me any and all outstanding monies that were due to me as a sign of good faith. Their response was… sorry we can’t pay you because our minimum payment threshold is £75 as you know and we can’t do anything because our system is automated!! I really laughed out loud… I remember being told the same thing in 1984 by someone who owed me money… Sorry but you missed the computer run which was on Thursday, you will have to wait until next month now! My response back then was, I don’t care get your old fashioned cheque book and send me my money or else I will sue you. The money arrived within two days. My response this week to Alamy was… In that case my resignation stands, stop selling my pictures and send me my money no matter how little!! Why should you get special terms? You signed a contract. The rest of us have to wait for the threshhold. BTW, it’s 75 DOLLARS, not pounds. I do have my reasons for requesting – as you call it – Special Terms but I don’t wish to air them in public. Suffice to say that one of the sales dates back to 2008. Moreover, it’s because of the obsequious attitude you take, that the likes of Alamy, Getty and the rest dictate to the marketplace and to the artistic and talented contributors. Consequently, the ‘Salespeople’ (because that’s all they are) are making the big bucks and the Photographers are grovelling to make a living! Good news indeed! Wishing all the best. Thanks for your sharing the details and very good information, Im so like to read your blog and I am satisfied with your writing contents. Keep sharing more news.